It was in Southsea that I realised we were going to pass an enormous amount of history in a relatively short distance. From here until we were through Porstmouth I seemed to be photographing something or other every few feet. Memorials; forts; bombs; obelisks; torpedoes; cranes; they were all there. I also realised very quickly that we were not going to be able to stop and devote the time to these waymarks which they probably deserved. Memorials to historical facts of incredible importance were acknowledged by us in a brief few seconds; a few strides later they had disappeared behind us as we moved on, consigned to our past as well as their own. It had to be this way if we were ever going to make it around the entire British coastline. At least it can be said that they served their purpose in reminding us of things past which should not be forgotten. One of these historical monuments, just by the hovercraft port, was an anchor from Nelson’s flagship at the Battle of Trafalgar, HMS Victory. I stopped, observed and took my picture. “This tribute of respect is placed in humble admiration of the departed hero by Lord Frederick FitzClarence, Lieutenant-Governor of Portsmouth, 1852”. In the 1880’s the anchor was moved to its present position. The Borough Engineer, H Percy Boulnois wrote, “Amongst other improvements which I carried out along the seafront was the re-arrangement of the various monuments, trophies etc, which had previously been more or less scattered along the beach. Amongst them was discovered the large anchor of the Victory, and I designed and erected a granite base on which the anchor was placed. This base had four tablets with appropriate inscriptions of which I was the author…After placing the anchor on its base, it looked rather bare, so I obtained a length of very heavy anchor chain and wreathed it round the shaft and stock, which gave it a very pleasing effect, but it was not there many days, as [a] candid naval friend observed to me, ‘Do you know that in the days of the Victory, anchor chains were unknown and only huge hawsers were used?’ I at once knew I had been guilty of an anachronism….. and the chain was at once removed and the anchor has gone bare ever since”. 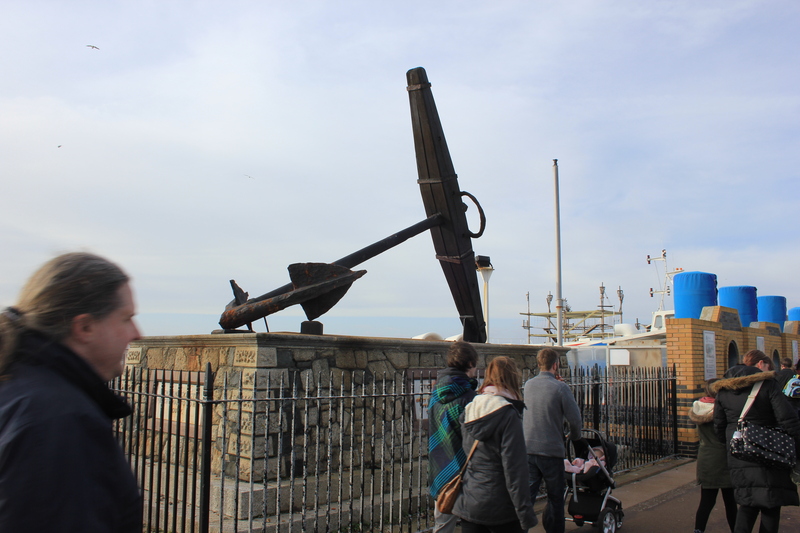 This entry was posted in Hampshire, Islands and tagged anchor, coast, Hampshire, HMS Victory, southsea, travel, walking. Bookmark the permalink.